A Pablo man was sentenced to 10 years with the Montana Department of Corrections with seven years suspended on a criminal endangerment charge at District Court in Polson on Thursday. District Judge Kim Christopher sentenced David Boyed Vanbouchaute, 32, to an additional year in the Lake County jail with that time suspended for one misdemeanor count of partner or family member assault. Vanbouchaute was initially charged with felony counts of assault on a minor, partner or family member assault, and misdemeanor unlawful restraint. 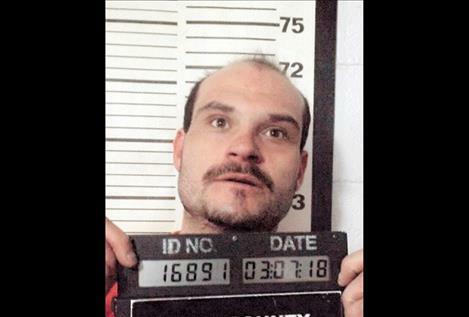 According to court records, Vanbouchaute was allegedly feeling the effects of methamphetamine when he began arguing with a partner or family member on March 6. The victim told investigators that the argument was about Vanbouchaute’s hallucinatory belief that his month-old child was not his son and that his son had died at the hospital. It was reported that the victim attempted to leave the residence with the infant, but Vanbouchaute, who was blocking the doorway, stopped her from leaving. Vanbouchaute is alleged to have grabbed the woman by the hair, thrown her down, and then, he grabbed the infant by his face and squeezed the baby’s head. The woman says she was forced to leave the infant behind and escape through a window. She went to a neighbor’s home and called 911. Lake County Deputy Attorney Brendan McQuillan would later tack on three felony counts of violating an order of protection and two felony counts of tampering with witnesses and informants after Vanbouchaute allegedly called the victim from the jail trying to get her to falsely testify. As part of a plea agreement, McQuillan agreed to amend the assault on a minor charge to criminal endangerment, reduce the partner or family member assault charge from a felony to a misdemeanor and dismiss all other charges. Vanbouchaute will also have to complete 40 hours of a batterer’s intervention program and any treatment programs deemed appropriate by the DOC. Judge Christopher gave Vanbouchaute credit for having served 100 days in the Lake County Jail.